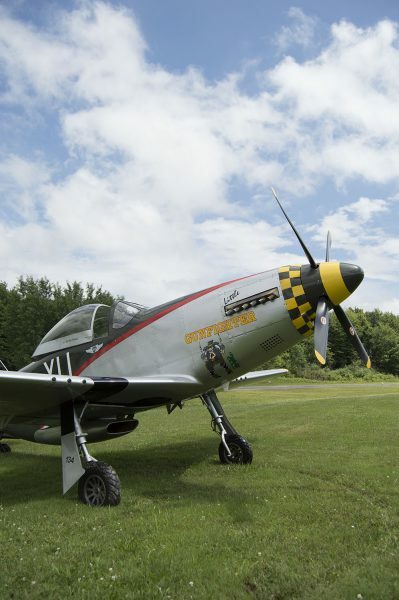 Team SocialFlight is building a three-quarter-scale P-51D Mustang. Here’s a peek at how it flies and how it will go together. Few aircraft capture the imagination like the iconic North American P-51D Mustang. Its elegant lines, aggressive stance and unique sound are so universally recognized that its presence stops even the least-aviation-oriented people in their tracks to appreciate its beauty. Seeing one in person is a special treat; flying one is a once-in-a-lifetime experience; owning one is reserved for an elite few who serve as temporary caretakers in the long history of these amazing aircraft. Titan Aircraft CEO John Williams is one of those people who make their own dreams come true. When the financial realities of owning a Mustang remained elusively out of reach, John took it upon himself to build a replica. Fortunately, he didn’t just create a one-off replica for himself; he created the Titan T-51D Mustang: a three-quarter scale experimental amateur-built kit that’s affordable, easy to fly and packs way more than three-quarters of the fun into this remarkable reproduction aircraft. I’ve seen numerous Titan Mustangs over the years during my visits to Sun-n-Fun and AirVenture, but my first chance to actually fly one came when I visited the factory in 2017. The aircraft I flew, nicknamed “Camel Smoker,” is Titan’s factory workhorse and engineering development platform. With Bill Koleno, Titan’s general manager, as my demo pilot, I received a full briefing on the aircraft’s flying qualities and operations. As Bill explained, these are tough planes meant to be built, flown and enjoyed by the average pilot. Entry into the aircraft is accomplished from the front of the wing by stepping up on the tire and wing, leaving you on the wingwalk next to the cockpit. A release button on the exterior allows the bubble canopy to slide back with a gentle pull on the canopy bow. After that, it’s a simple affair to step down into the seat and buckle into the harness. Titan T-51D Mustang "Little Gunfighter." As you settle into the cockpit, the anticipation of a unique experience sets in. The cockpit is a Spartan mix of olive drab metal, khaki canvas seat cushions and a black instrument panel filled with mostly analog gauges. The feeling is remarkably similar to my experience sitting in an actual Mustang. In an effort to get even closer to the original, Titan has experimented with a reproduction gear/flap/trim quadrant originally created by one of its customers that is an exact replica of the original P-51. Bill yells “clear” and, after a few turns of the prop, the V8 engine comes to life and settles into a deep rumble. The GM LS3 8-cylinder engine is Titan’s current engine of choice for the T-51D. The LS3 produces 425hp in the Corvette in its stock configuration, but it’s derated to 310hp in the T-51D. It comes to Titan as a brand-new “crate engine” that Titan customizes by adding its gear reduction unit (made by Autoflight) and a few other custom pieces, such as the water pump and oil sump, to make things fit and function better for use in the T-51D. Strapped in and ready to go, we taxi out to the end of the runway. Like most taildraggers, its visibility over the nose is poor, but the combination of the sliding canopy and narrow fuselage of the T-51D makes it possible to lean out to the side to see forward. After a brief run-up, it’s time to fly. I follow Bill on the controls. As he advances the throttle, the V8 engine roars, and I’m pushed back in my seat as the brakes are released. The aircraft quickly rotates onto the mains, and we’ve broken ground before I even had a chance to evaluate the aircraft’s handling on the runway. At 3,900 RPM, the Mustang is climbing at over 2,500 fpm. By the time we make our first turn, we’re already above the traffic pattern, and Bill hands the controls over to me. After a couple of gentle clearing turns, I begin to feel out the aircraft with some steep turns. The T-51D Mustang is a remarkably stable aircraft that’s easy to fly, but it does require rudder coordination. How’s the control feel? Well, it depends on which seat you’re sitting in. The control stick configuration includes a force multiplier that makes the forward stick lighter on the controls than the aft stick. This is an intentional design feature that gives the primary pilot an agile feel that begs for some aerobatic play. However, the folks at Titan Aircraft knew from the beginning that the aircraft will be giving plenty of rides to both pilots and non-pilots in the rear seat. So the rear control stick requires more force to achieve the same roll and pitch rates. The design works remarkably well. The T-51D is rated at a +6g /-4g load limit capability at a gross weight of 1,850 lbs. As we put the Mustang through its paces with a series of barrel rolls and wingovers, it’s easy to understand why I’ve never seen one flying straight and level for an extended period of time. The plane simply begs to be rolled, and it does so smoothly and effortlessly. After alternating between time spent in maneuvers to evaluate the aircraft’s characteristics and simply playing around for fun, we head back to the airport. At 3,000 feet and only a mile from the airport, I’m expecting a turn outbound to lose altitude before we enter the traffic pattern. But, with no aircraft active in the area, Bill uses the opportunity to demonstrate how quickly the T-51D can descend when required. Pulling back on the throttle and flattening the prop pitch creates the equivalent of a huge speed brake in front of the aircraft. My body pushes forward against the five-point harness as the aircraft quickly slows down and we descend. You can literally point the aircraft down with the flattened prop and hang that way while quickly losing altitude but without over-speeding or overoverstressing aircraft. Leveling out at traffic pattern altitude, we slow below 100 mph, and Bill deploys the gear and flaps. The pattern is flown at 80 mph, further reducing to 70 mph on final with wheel landings generally done at 50 to 60 mph. To maintain forward visibility, it’s advised to hold the tail in the air as long as possible (10-20 mph). As taildraggers go, the T-51D Mustang is tame and stable on roll-out and taxi off the runway. Climbing out of the aircraft, I realize that my cheeks hurt from smiling. I’ve flown over 40 different aircraft types, but the T-51D made it to the top of my list after only one flight. It’s a remarkably inspirational way to begin the multi-year process of building our own Mustang back at our home workshop in Massachusetts. Back at the Titan factory, we get a tour of the design and construction of the aircraft from Bill and John. 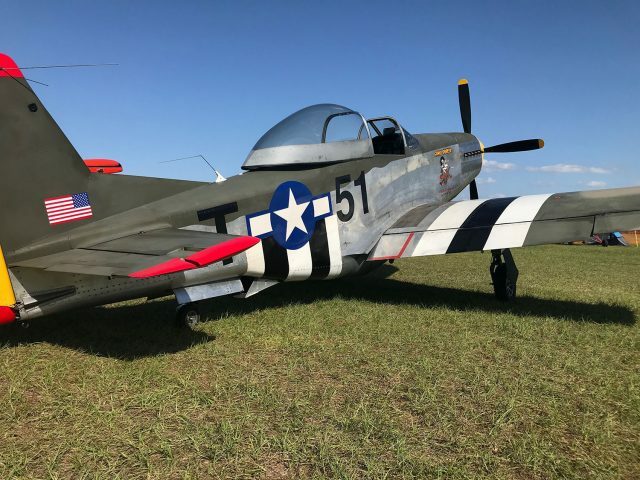 At three-quarter-scale from the original Mustang, the T-51D Mustang is fairly large by kitplane standards: 23 feet, 6 inches long from spinner to tail with a 24-foot wingspan. The cockpit is 26 inches wide with 48 inches of head room and 46 inches of leg room; plenty of room for even larger-size pilots. The seats are height-adjustable and the rudder pedals are adjustable fore and aft, providing enough flexibility to accommodate most pilots. The fuselage has a unique design, utilizing a welded tube frame that goes from firewall to tail. It comes in two pieces that are bolted together in minutes during the first steps of assembly, leaving the building with something that actually looks like an airplane from day one (which is really helpful for motivational purposes). Aluminum “hat sections” are cut to length and bonded to the frame from the inside out, creating mounting flanges on the exterior edges of the frame that the aircraft skins are glued and riveted to. This results in a remarkably strong semi-monocoque structure with stressed aluminum over a steel frame and a combination of glue and rivets bonding it all together. If there ever were an aircraft designed with both “belt and suspenders,” this is it! The center section is, perhaps, the most pre-built part of the aircraft. Titan considers this section so critical to the safety of the aircraft that it delivers the center section almost fully assembled, including installation of the landing gear. The critical wing center spar and all major components are built on a factory jig and ready to go. The builder’s main job is to install the hydraulic, fuel and electrical systems. The wing and tail are equally straightforward for the builder to assemble. Following on the same basic design as the Titan Tornado LSA, the leading edges of the wings and tail utilize an aluminum-over-foam core construction, where the aft edge is attached to the main spar. From an outsider’s perspective, the wings look almost done when they arrive, but there is still much to do regarding systems installations, fitting, trimming, etc. At this time, the plane is available with two wing variants: the stock wing and a new “Speed” wing. The stock wing was designed around John’s original goals of an extremely docile, easy-to-fly aircraft that was safe for basic aerobatic maneuvers. However, there is some sacrifice in cruise performance with the stock wing. For customers looking for over 200 knot cruise performance, Titan has created the new speed wing. Everything else about the aircraft is the same, but the new wing adds over 20 knots to the upper end of the speed envelope. There are compromises in life, and understandably the new wing is not as docile during stalls and at the lower end of the speed envelope. The standard wing is still Titan’s recommendation for most buyers. Since both wing and center section are designed for one another, you cannot upgrade the wing later without replacing the center section as well. In all, Titan estimates about 1,600 hours of labor to build its T-51D Mustang kit, though every project and every builder is unique and many kit plane builders will need more time to finish, sometimes because they add customizations not factored into Titan’s ballpark estimate. At SocialFlight.com, we inspire pilots to fly more by giving them free access to over 10,000 aviation events and places to fly. 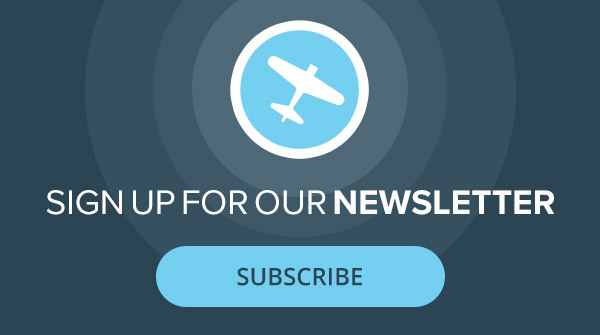 Beginning in January 2018, we expanded our mission to connect with pilots and aviation enthusiasts with our own documentary series of articles and videos on building a T-51D Mustang in our home. In just a few short months, the excitement of watching the plane come together has been the singular focus of everything that happens in our home. After all, the build is literally taking place in our former living/dining room! Our hope is that our build experience will inspire others to reach higher and make their own dreams come true. Along the way, we also will be teaching about avionics, aircraft lighting, tools and much more. 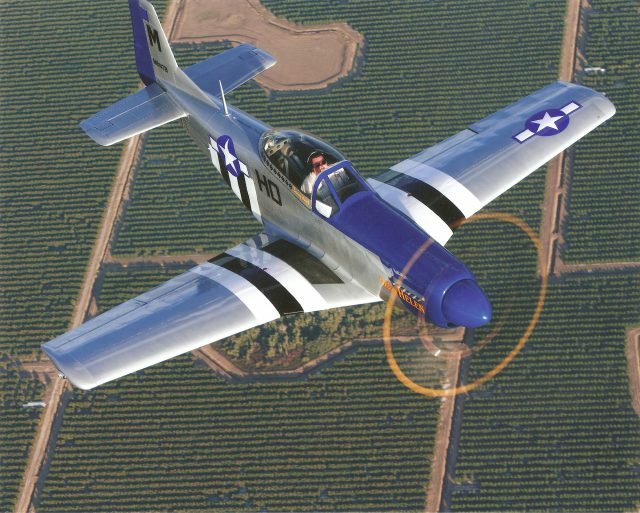 Viewers will have input into our aircraft build and, through online participation and interaction with our team, some viewers may win T-shirts and even a flight in an actual T-51 Mustang, courtesy of Titan Aircraft and Plane & Pilot. The journey has just begun, and we look forward to sharing more with you in future articles. You can follow our weekly progress and videos at: www.YouTube.com/c/SocialFlight and our blog: SocialFlight-T51.com.